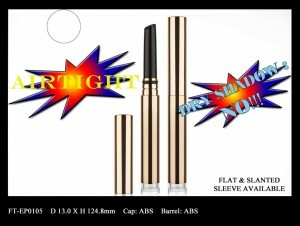 Airtight make-up pen for eyeshadow and eyebrow products – Cosmetics Packaging Supplier | Fancy & Trend Enterprise Co., Ltd.
Meet us @ Cosmoprof Worldwide Bologna 2018! 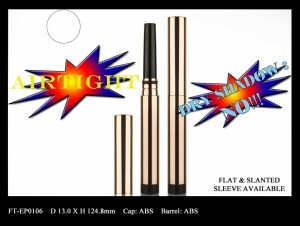 Fancy and Trend introduces its new airtight make-up pens provided that are specially designed for eyeshadow and eyebrow cosmetic products. The airtight component makes sure creamy formulae stay in perfect condition without compromising on the quality. The airtight make-up pen is composed of ABS plastic components with an o-ring at the closure. The o-right keeps the entire packaging airtight without fail. There are two types of aperture shape for optional product design, the flat-cut aperture allows domed shaped product, while the slanted-cut aperture holds flat-topped product. Either design provides different sort of user experience depending on a product usage.